Our day–to–day world is ablaze with colour. Information we seek is presented in bright colours, via displays ranging in size from small touch screen mobile phones to large screen plasma televisions. An understanding of the scientific principles underlying the generation of colour is increasingly important to a wide range of academic disciplines, including physics, chemistry, biology, materials science and engineering. 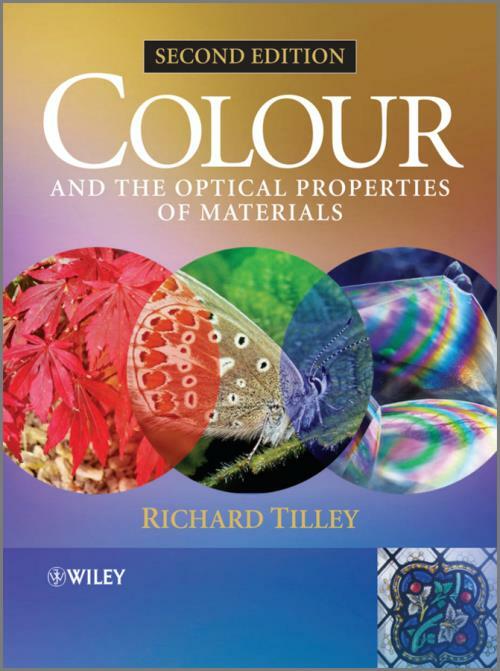 Now in its second edition, Colour and the Optical Properties of Materials provides a thorough scientific overview of all aspects of colour and its relationship to the chemical and physical properties of materials. Primarily aimed at undergraduate students but of interest to anyone seeking an understanding of colour in its many manifestations, the book focuses attention on the ways that colour is produced and how these govern device applications. Richly illustrated in full colour throughout. Introduces the science behind the subject whilst closely connecting it to relevant examples of colour in everyday life, such as iridescent butterflies, electronic paper and brightly coloured holographic security markers. Each chapter has been totally rewritten and each diagram redrawn to include extensive new material, including quantum dot nanoparticle colours, OLEDs, photonic crystals and plasmonic crystals and sensors. 1.5 Light waves and colour. 1.6 Black body radiation and incandescence. 1.7 The colour of incandescent objects. 1.13 The interaction of light with a material. Appendix 1.1 Definitions, units and conversion factors. 2 Colours due to Refraction and Dispersion. 2.1 Refraction and the refractive index of a material. 2.3 Refractive index and polarisability. 2.4 Refractive index and density. 2.5 Invisible animals, GRINS and mirages. 2.6 Dispersion and colours produced by dispersion. 2.10 Negative refractive index materials. 3 The Production of Colour by Reflection. 3.1 Reflection from a single surface. 3.2 Interference at a single thin film in air. 3.3 The colour of a single thin film in air. 3.4 The reflectivity of a single thin film in air. 3.5 The colour of a single thin film on a substrate. 3.6 The reflectivity of a single thin film on a substrate. 3.7 Low–reflection and high–reflection films. 3.11 Photonic engineering in nature. Appendix 3.1 The colour of a thin film in white light. 4.4 Crystal symmetry and refractive index. 4.5 Double refraction: calcite as an example. 4.6 The description of double refraction effects. 4.7 Colour produced by polarisation and birefringence. 4.10 Frequency matching and phase matching. 4.11 More on second harmonic generation. 5 Colour due to Scattering. 5.2 Tyndall blue and Rayleigh scattering. 5.3 Blue skies, red sunsets. 5.6 Blue eyes and some blue feathers. 5.7 Paints, sunscreens and related matters. 5.9 Gold sols and ruby glass. 6 Colour due to Diffraction. 6.1 Diffraction and colour production by a slit. 6.2 Diffraction and colour production by a rectangular aperture. 6.3 Diffraction and colour production by a circular aperture. 6.4 The diffraction limit of optical instruments. 6.5 Colour production by linear diffraction gratings. 6.7 Estimation of the wavelength of light by diffraction. 6.8 Diffraction by crystals and crystal–like structures. 6.10 Diffraction by sub–wavelength structures. 7 Colour from Atoms and Ions. 7.1 The spectra of atoms and ions. 7.3 Atomic spectra and chemical analysis. 7.4 Fraunhofer lines and stellar spectra. 7.5 Neon signs and early plasma displays. 7.7 Sodium and mercury street lights. 7.8 Transition metals and crystal field colours. 7.9 Crystal field splitting, energy levels and terms. 7.10 The colour of ruby. 7.12 Emerald, alexandrite and crystal field strength. 7.13 Crystal field colours in minerals and gemstones. 7.14 Colour as a structural probe. 7.15 Colours from lanthanide ions. 7.16 The neodymium (Nd3+) solid state laser: a four level laser. 7.17 Amplification of optical fibre signals. 7.18 Transition metal and lanthanide pigments. Appendix 7.2 Terms and levels. 8.1 The energy levels of molecules. 8.2 The colours arising in some simple inorganic molecules. 8.3 The colour of water. 8.4 Chromophores, chromogens and auxochromes. 8.5 Conjugated bonds in organic molecules: the carotenoids. 8.6 Conjugated bonds circling metal atoms: porphyrins and phthalocyanines. 8.7 Naturally occurring colorants: flavonoid pigments. 8.9 Some dyes and pigments. 9.2 Activators, sensitizers and fluorophores. 9.3 Atomic processes in photoluminescence. 9.6 Cathodoluminescence and cathode ray tubes (CRTs). 9.7 Field emission displays (FEDs). 9.13 Fluorescent markers and sensors. 10 Colour in Metals, Semiconductors and Insulators. 10.1 The colours of insulators. 10.3 Impurity colours in insulators. 10.4 Impurity colours in diamond. 10.6 The colours of semiconductors. 10.7 The colours of semiconductor alloys. 10.8 Light emitting diodes (LEDs). 10.11 Organic semiconductors and electroluminescence. 10.15 The colours of metals. 10.16 The colours of metal nanoparticles. 10.17 Extraordinary light transmission and plasmonic crystals.